We are your pitch guru. We find out when the audience was listening and which words made them lose their interest. Quote from Forbes: "70% of CEOs say presentation skills are critical for career success". We see nowadays uncountable presentation tips. You should start strong, end strong, tell a story, make a joke, you should have a WOW factor, and so much else. We don't think that just practicing and leaning on tips is the best solution to achieve the best possible presentation. We think technology must just have a better way. So that's why we created PitchBack. PitchBack is your pitch guru. It makes 2 things: on the presentor side, it listens to every word he's saying and when he's saying them, and run an algorithm which extracts information out of this text (wether sentiment is positive, negative and text complexity). On the audience side, it recognizes the faces and the characteristics of the faces, such as sentiment (anger, joy, surprise, etc) , the angle of the face and also recognizes the eyes, which allows us to differentiate when people are paying attention or not. We then make a match between the attention level (got from the camera) and the speech components, so that the speaker can see after the talk which approach delivered the best results, which is after all to engage the audience. That way, he can deliver the best presentation possible. We built it a microserver with Flask and Werkzeug deployed to the Microsoft Azure Cloud. 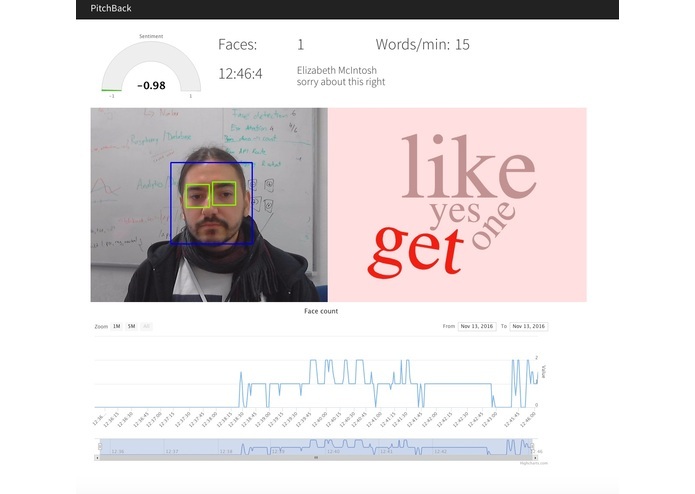 We get speech and image data from the Raspberry Pi and feed openCV and Speech Recognition/Vision API. On top of that we had algorithms for text feature extraction (Py NLTK) and for image processing (openCV) which were processed on the Azure cloud. For the Front End we used D3.js for nice visualization and live updating of the graphs. It would be great to validate the idea and see more use cases for it. We believe it can help different target audiences, for instance, entrepreneurs, professors and really anybody that has to deliver a presentation in front of a huge audience. I worked on the voice to speech recognition, the natural language processing and helped with designing the frontend.